Hampton Cherry finish on select hardwoods and veneers, distressed for an aged appearance. Swan-neck pediment with bookmatched olive ash burl and carved urn finial. Dial features brass Arabic numerals, cast center and corner ornaments, and a moon phase with exclusive Presidential Collection hemispheres. Polished-brass pendulum, with cast enter disk, and weight shells with decorative bands. Canted columns with large reeds and intricately carved caps. Multi-tiered base, with canted corners, olive ash burl, carved moldings, and uniquely carved front feet. 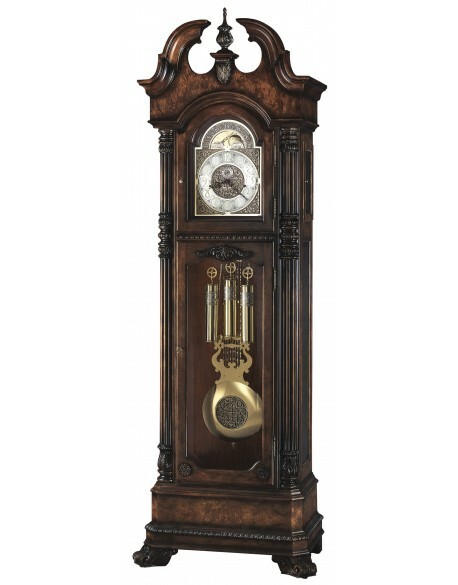 Cable-driven, triple-chime Kieninger movement plays choice of Westminster, St. Michael, or Whittington ¼, ½, and ¾ chimes accordingly with full chime and strike on the hour.